As my time at the Christoph Keller Jr. Library draws to a close, I am able to reflect on how much I have learned about the field of academic librarianship. 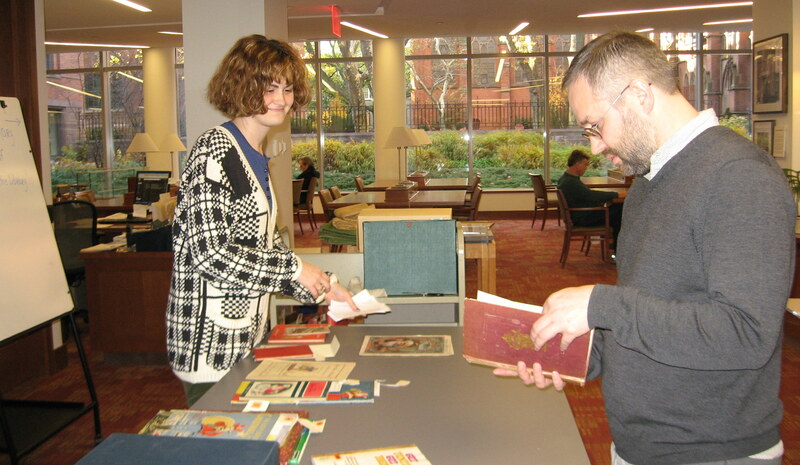 The best thing about this internship was the willingness of Library Director Drew Kadel, Technical Services Librarian Patrick Cates and Reference Librarian Mary Robison to give me as many hands-on opportunities as possible. One of the greatest learning experiences has been working alongside Mary and Patrick to put together the exhibitions. For example, when preparing for the Night Before Christmas exhibit, I was given free rein to choose which materials I wanted to include, the chance to write all of the item labels, and the ability to arrange each book in the cases as I saw fit. This type of experience is extremely valuable in a competitive field that emphasizes critical thinking as well as creativity. Having the opportunity to catalog some of the incoming rare books into the collection was something that I initially approached with trepidation. I can now confidently say it has been one of the most valuable learning experiences during my time here. It will allow me, as I go on interviews, to talk about my knowledge of specific library resources. Interning at GTS has provided me with the essential well-rounded library internship that students constantly seek. Coming from a history background, I also enjoyed the opportunities to gain a richer understanding of the Seminary itself by working intimately with Special Collections materials. As much as I am a librarian-in-training, I will always strive to be a student as well. The materials in the Christoph Keller Jr. Library, such as the architect Charles C. Haight’s blueprints of the Chapel of the Good Shepherd , and the fascinating ancient Egyptian funerary figurines from Dean Hoffman’s collection, are some of the most striking that I have encountered throughout my studies. The practical experience I have gained working in an academic library setting and the valuable contacts I have made this semester will be extremely beneficial for me in my future endeavors. Keller Library intern Megan Izzo is a student at the Palmer School of Library and Information Science of Long Island University, and a graduate of the University of Delaware. Patrick Cates and Mary Robison (and the rest of the staff at the Keller) have been thrilled to have Megan here this semester and wish her every good thing in 2014!